Humane Squirrel Trap be sure you thoroughly understand the squirrel trap directions. Peanut butter or snicker bar is considered the best bait for a catching a squirrel in your loft or garden. Placing a teaspoonful of peanut butter through the bars under the treadle or a cube of snicker bar clipped to the back treadle plate with a paper clip usually works best. Your first step to catch your Grey Squirrel is to do a little detective work. Find the path that the squirrel is using to your loft or where ever it shouldn’t be. To find this path, you must first watch your grey squirrel’s routine. Normally, a grey squirrel will leave the nest at daybreak or shortly after in search of food. If you can get up this early and stay awake it’s the best time to watch and wait. Find a place where you can view your house and the squirrel’s entrance hole. Be very still, and watch how the squirrel gets to or from it’s home to your’s. E.g. climbing, jumping or both. Once you discover this path, you should place the Trap Man humane live catch squirrel trap accordingly. 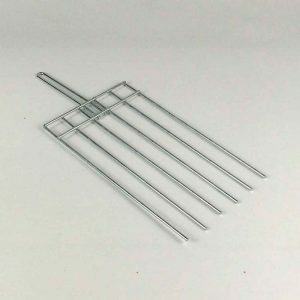 View basket “Small trap comb divider” has been added to your basket. Approved in the UK to catch & kill rats & grey squirrel. Mk4 Fenn traps for professional use only, pest controllers, farms, estate management and game keepers. The trap man simple grey squirrel trap has a spring loaded door with a locking tab that once triggered keeps the door securely fastened. The trap is triggered by the squirrel standing on the tread plate inside the cage which releases the spring loaded door. It is constructed from heavy gauge square mesh that is electro plated after manufacture for a hard wearing long lasting, rust resistant finish. Easy to set with detailed setting instruction available online. The trap man pro gold grey squirrel trap has a spring loaded door with a locking bar that falls behind the door once triggered keeping the door securely fastened. The trap man grey squirrel trap has a spring loaded door with a locking bar that falls behind the door once triggered keeping the door securely fastened. Easy to set with detailed setting instruction available online, video link at bottom of page. Trap comb dividers used in pairs give you the option to “push” the animal safely into a trap transfer cage for transport. Whole yellow maize trapping bait, small bag 500g approx. Use as bait lure for grey squirrel, pheasant, pigeon, wood pigeon. Proven to be the best grey squirrel bait especially in woodland situations. Twin entrances, Two lifting handles, Welded frame with 1″ x 1″ strong plated wire. Our approved size restricted entrance fulfills the requirement to prevent access to none target species.